I was introduced to Spark by my cousins who saw me drinking all kinds of energy drinks every day. When I woke up, I reached for one of those huge cans of energy. I wasn’t paying attention to what was in them as much as I was needing the little boost they gave. If you have used those drinks, you know what the cost of that little boost can be! A huge let down when it wears off. Spark was different. It wasn’t something that I even noticed at first. It didn’t make me hyper and was bouncing off the walls afterwards… it was a sustained energy. It was just what was needed for me. I’ve seen my nephew’s grades go up consistently since he started drinking spark each morning. His first class of the day was his worst and now he’s making A’s and B’s not only in that class but ALL of them now! All he says is please don’t let me run out. He is convinced it was the Spark that made the difference for him in school. Who am I to argue? I knew he didn’t need the normal energy drinks kids his age are chugging. 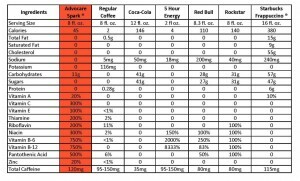 Just take a look at the chart below to see how some other drinks rank against Spark. If you want to get a little more active… nap a little less… feel energized during those afternoon slumps, give Spark a try! 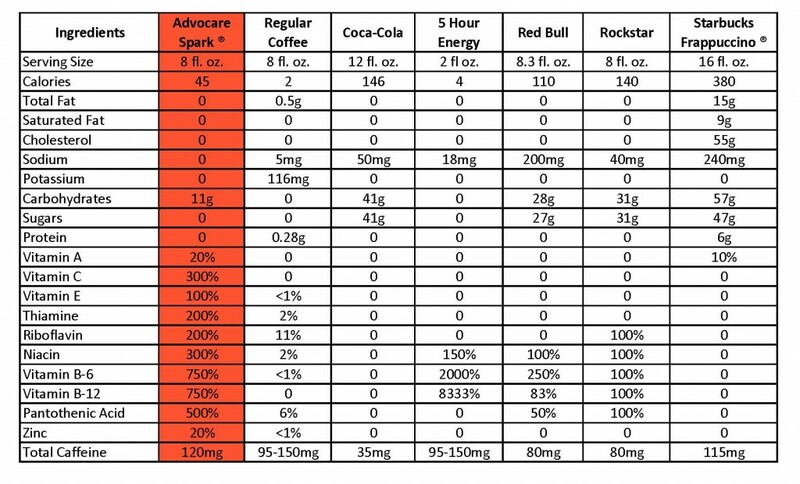 If you’ve checked out the chart above, you have seen the wealth of vitamins Spark contains. And you probably noticed the lack of some of that other stuff that you may have noticed in other drinks. Most notably missing is sugar! Each flavor tastes great. I believe my favorite is orange, mango, and punch. But, I do love them all.